Religious TV Channel / BENIE TV is a pan-African TV of Christian obedience. BENIE TV is therefore a tool for positioning and spreading the Gospel and the activities of economic operators in Africa. It thus offers them the opportunity of excellent visibility and effective coverage throughout its coverage area, but mainly in Africa. It is received free of charge using a decoder and a parabola oriented in the position of the different satellites through which it emits. BENIE TV makes available to all advertisers, partners, and sponsors a communication platform for the dissemination of their messages, announcements, spots and any other information relating to their activities with the aim of. 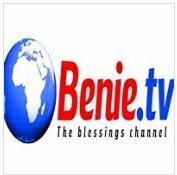 Benie TV is a Pan-African television of Christian persuasion Benie TV is therefore meant to be a tool of positioning and of radiance of the Gospel and of the activities of the economic operators in Africa. She gives them so the opportunity of a very good visibility and of a real radiance in all her zone of cover, but mainly in Africa.